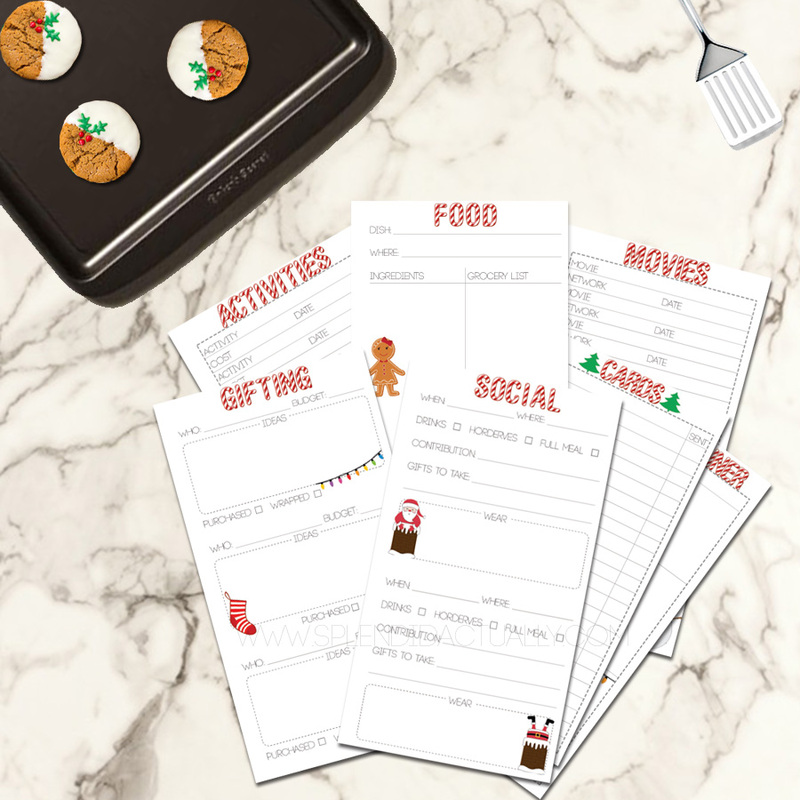 splendid actually: Christmas Planning: Tips + Free Printables! The holiday season is upon us! I mean, Hobby Lobby has Christmas decor out, so it has to be close, right?! Oh wait, holiday decor is out in June... I guess that's not a good frame of reference. Regardless, for those of us organizational nuts out there, we have already started our holiday planning, gift lists, etc. So it's the perfect time to get yourself in the holiday mood, and I'm here to help you. 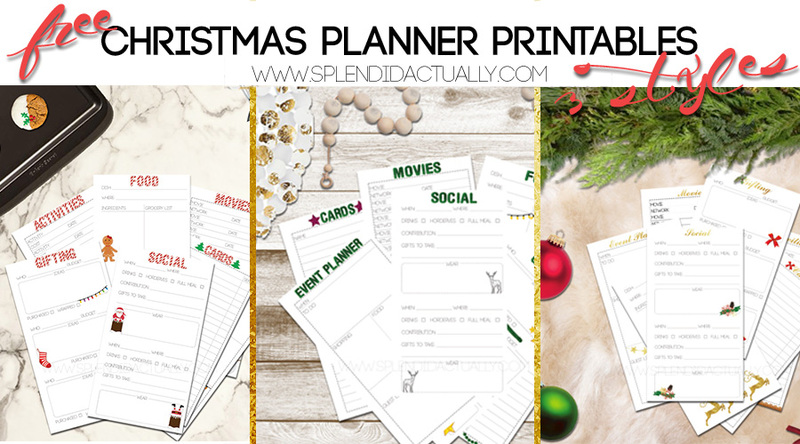 Today I'm sharing a Christmas planner, or to be more specific, Christmas inserts for your personal planner. To help you plan, scheme, and enjoy the rest of the year, these inserts will be your new best friend. I'm also going to share some of my favorite ways to beat the crowd yet also relax and absorb the season. First, let's go through the inserts. There are three different style to choose from to meet your decor style: Christmas Cheer, Merry Modern, and Glitzen. 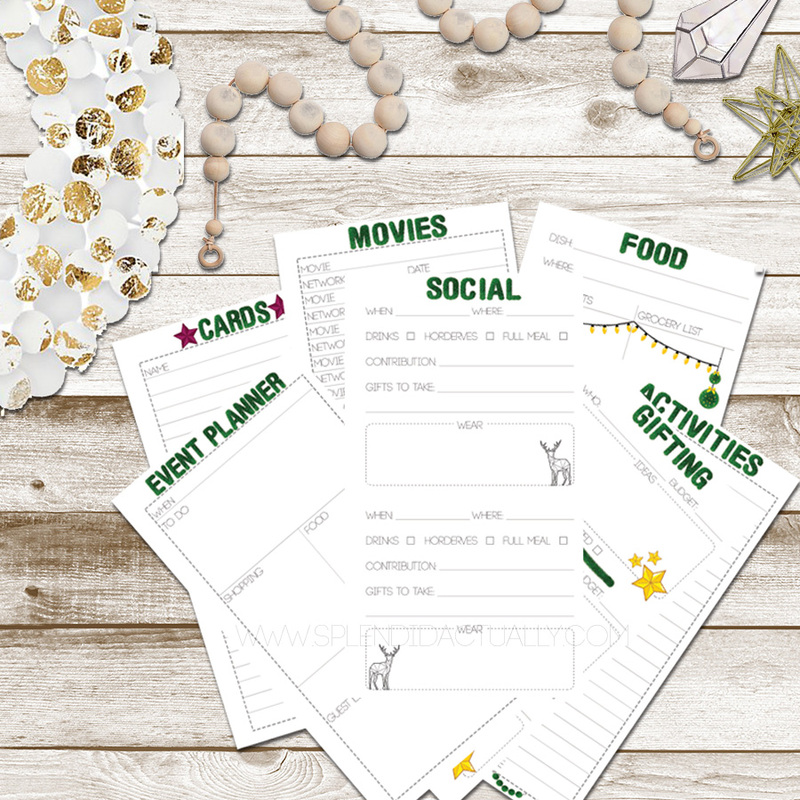 The Activities sheet is for collecting a list of community events and outings that you want on a wish list. For example, my city has a luminary walk at our cultural center, so you can absorb some city history while everything is decorated for the holidays. There's a place to put the date, the cost, and the what the activity is. You could also add things like gingerbread making or gift wrapping, if you want to make an event out of those things. 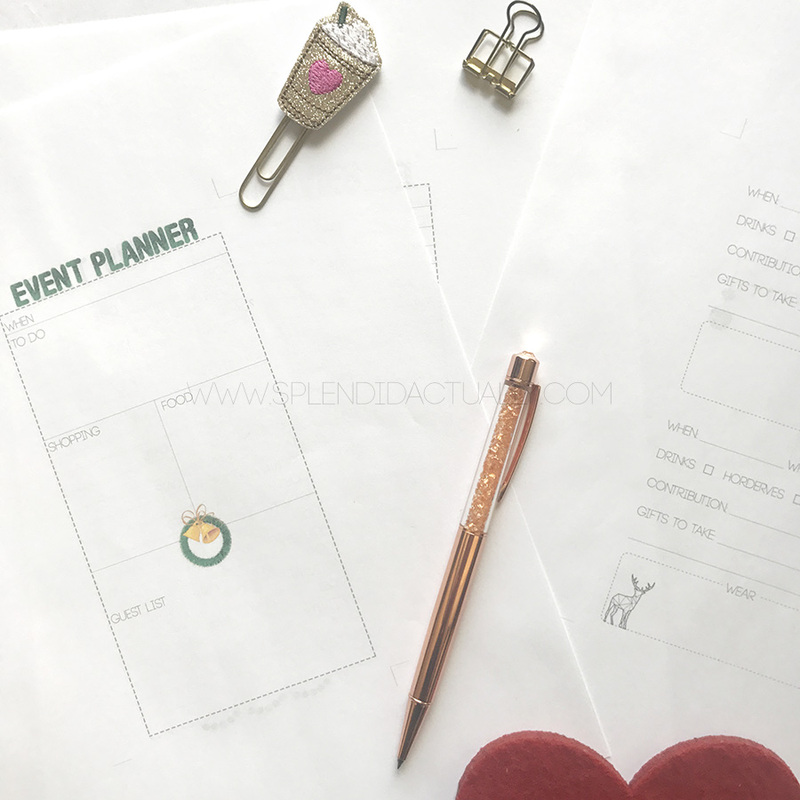 Speaking of events, for those that typically host around the holidays, there is an Event Planner sheet for organizing the party. It includes a guest list, food list, shopping list and to-do list. I don't normally host anything this time of year, but my hubby's birthday is two weeks before Christmas, so this year I'm going to host something to really celebrate him. For those that are invited to lots of things, the Social sheet can help you keep track of all of those parties. The most important part is remembering what gifts to take to what event. I somehow always end up with a small pile of gifts for the people I saw early on in the month, but didn't think about bringing their gift to the party. It's also fun to figure out your holiday outfits, so there's a place to jot those down, too. Be sure to check what out the food situation prior for day-of planning; nothing worse than thinking your going to a dinner party when it's actually a happy hour and feeling starved the entire time. Food around the holidays is always a treat, but I can never remember what I'm taking where or what I need to pick up at the grocery that week. The Food sheets will help because you can include where the dish is going, all the ingredients and the grocery list in one spot. While it may be a little repetitive from the Event Planner and the Social sheets, it will be helpful to have all the food in one spot. There's nothing better in December than Christmas movies. Make a list of your favs, when they come on TV (if you're watching via cable) or where you can find it when you're ready (Netflix? Amazon?). Then when you sit down to wrap presents, you can check your list to see what you still need to watch and you won't miss out on your favorites. Possibly the most important page is the Gifting sheet. Use it to help you with ideas, budgeting, and tracking the status. That way, when you're preparing for a party, you can check to make sure you have the gifts you need and they are wrapped for delivery. 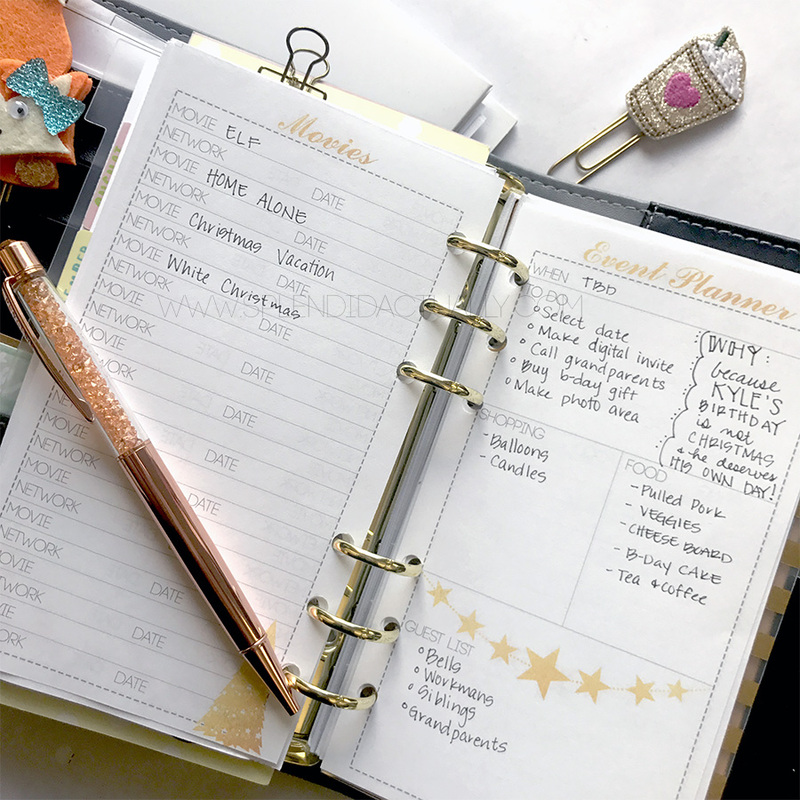 I've used a gifting insert in my planner for the past couple of years, and it's wonderful for a peace of mind. Lastly, but maybe the most important, is your Card Tracker. I realize that not everyone sends holiday cards, but they are so fun and everyone loves to get some happy mail. So make out a list and get started on them early. I especially love to sit down the weekend after Thanksgiving and work on addressing envelopes while watching my first holiday movie of the season. In fact, watching a movie while doing other Christmas tasks is probably my favorite way to spend the season. The movie helps me to relax and puts me in a great mood. Then whatever task I'm working on seems a little less stressful and a lot more fun. Not a movie person? Turn on a holiday playlist on Spotify or Pandora. There are so many great holiday tunes you're bound to find something to lift your spirits. For a lot of people, shopping is the most stressful part of the holidays. Even if you have great ideas, the daunting task of battling the crowds, parking, and cold weather can sometimes be overwhelming. I have two tips: if you are specifically looking for ideas, head to the store knowing you don't have to buy anything. 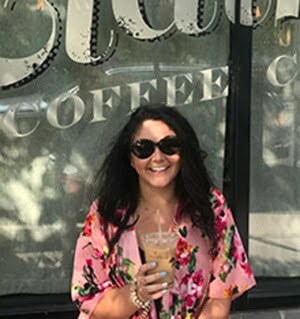 Let yourself just window shop, sip on a warm drink, and just enjoy the energy. 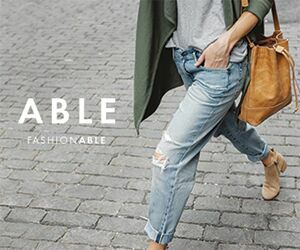 Gather your ideas, then head home - skipping the checkout lines, worrying about where you stuck receipts, etc. Then when you get home, jump online and order the gift you decided on. Most stores offer free shipping around the holidays, so search for a promo code if it's not already listed on the site. Set a deadline for ordering gifts a couple weeks before Christmas, so that there are no concerns about items getting to you in time. Then once your packages arrive, you can breathe easy and work on the most fun part in my opinion - wrapping! Also, keep a digital folder of all order confirmations/receipts so that you can print it out and include it in the box or bag when wrapping. That way it's convenient for the receiver to exchange sizes, etc. without having to ask you for it later. I hope these tips help you to enjoy the holiday season. Honestly I've found that the more organized I am, the more I can relax. With built-in down time and fun activities, it makes it enjoyable and fun. 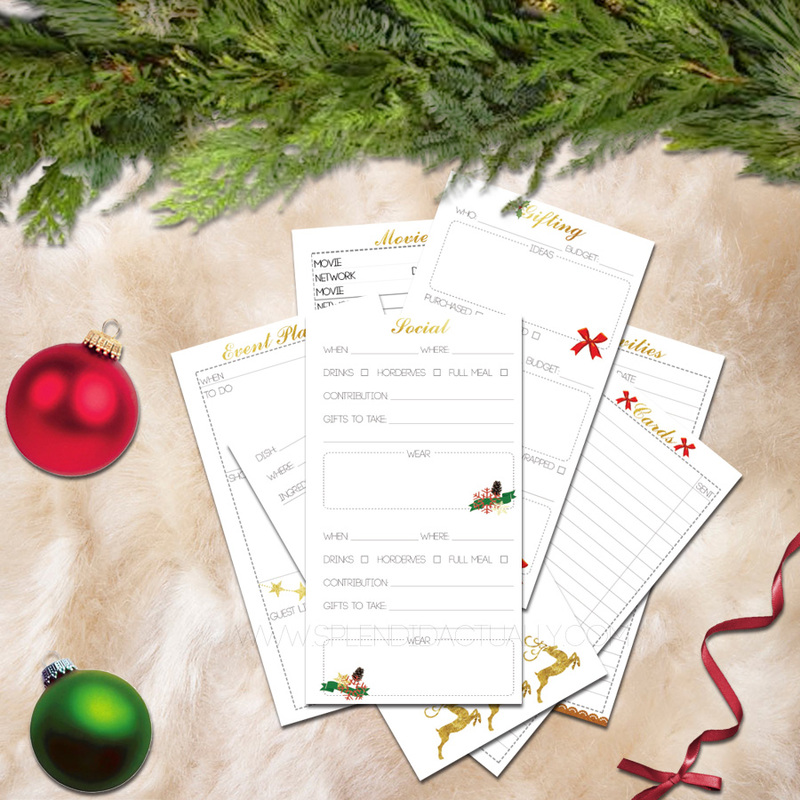 Download all three versions of the Personal Christmas Planner here. Please share how you use the inserts on Insta using #splendidactuallyxmas. I can't wait to see how you use them!